The NJ Wilds is a project created by Monmouth County high school students Priyanshi Jain and Victoria Momyer. The purpose of the Wilds is to convey the importance of wildlife conservation in New Jersey across the Internet, transcending the concept of location. Wildlife and all living things in general are part of the biosphere, a balanced network consisting of many ecosystems. Because there are so many ecosystems and ecosystems affect other ecosystems, the extinction of one species can have major effects on other species. THEY HELP PRESERVE NATURAL DIVERSITY. NJ is one of the few lucky states that have a rich diversity, and so it is important that we maintain this diversity. New Jersey and the coast have over 900 vertebrate species and countless invertebrate species. The extinction of one species can cause a chain reaction, which could have unprecedented effects on other species and the ecosystem in general. THEY CONTRIBUTE TO BIODIVERSITY AND AGRICULTURE. Certain animals and plants can be used as natural forms of pest control. This way is a more safe, less expensive and more effective than synthetic chemicals. For example, in mid 1900s the population of the bald eagles and peregrine falcons declined quickly; this showed the dangers of DDT, which was a widely used pesticide at the time. The DDT decreased fertility and egg hatching, which made the populations decline rapidly. This showed humans that DDT is dangerous and that we need to reduce its use. THEY CAN ACT AS ENVIRONMENTAL MONITORS. Many animals and species can serve as indicators of environmental changes that humans may not notice or realize. If some species were to be removed it could permanently disrupt the entire structure of the ecosystem and create many problems within the populations of other species. THEY HELP SUPPORT THE STRUCTURE OF THE ECOSYSTEM. Each organism and specie plays an important role in the ecosystem. They all play their own specific roles, which help set up the structure of the ecosystem. One example would be our home, New Jersey, which makes millions of dollars just from wildlife. Many people who enjoy watching wildlife spend money on going to zoos or reservoirs or animal parks to see and enjoy the wildlife. THEY CAN PROVIDE ECONOMIC SUPPORT TO ITS LOCAL AREA. Wildlife can also benefit humans economically. Nature surrounds us all the time, but not everybody appreciates its beauty, why? Many people do not take the time to think about the diversity of animals and species surrounding us, but when they do they can truly appreciate all that nature has to provide, especially New Jersey which has been gifted with hundreds and thousands of species of plants and animals. THEY ALLOW US TO APPRECIATE THE BEAUTY OF NATURE. Only when we actually see something or notice it, can we truly appreciate it. Wildlife allows people to focus on other things that are not related to human activity or technology orientated. Also if we take better care of the environment, we can help preserve many of the natural resources for the future. THEY ALLOW US TO HAVE POSITIVE INTERACTIONS WITH OUR ENVIRONMENT AND CREATE A MORE SUSTAINABLE FUTURE. In caring for the wildlife around us, we promote the general welfare of our environment, allowing us to establish some sort of harmony with nature and ourselves. THEY CAN POSSIBLY CONTRIBUTE TO MEDICINE. All organisms and species has their unique set of genetic material, which if lost can’t be retrieved again. If organisms start becoming extinct before we even find them, we can lose many different great opportunities and solutions to our problems. Because species have a unique set of genetic material, if they become extinct we lose their specific set of genetic material, which could have potentially helped us in solving any or some problems. This is a valid possibility because as can be seen currently, over ¼ of the prescriptions written in the United States every year have chemicals and compounds that were found in one or many animal and/ or plant species. All organisms and species play an important part in our life, whether it be providing us with milk or killing the insects that we hate to see around us. THEY SERVE MANY DIFFERENT ROLES IN THE ENVIRONMENT THAT BENEFIT US. Plant species provide the oxygen we breathe; other organisms clean our drinking water; other species put nutrients back in to the soil which allow the plants we eat to grow better and healthier. Without wildlife, we would lack many of the essential things we now need. This is the same with all other animals. They provide instantaneous happiness, which can’t be replaced by any other feeling. THEY CAN MAKE US HAPPY AND PROVIDE AESTHETIC PLEASURE. Not only do they make us happy, but they also make our environment look prettier and livelier. 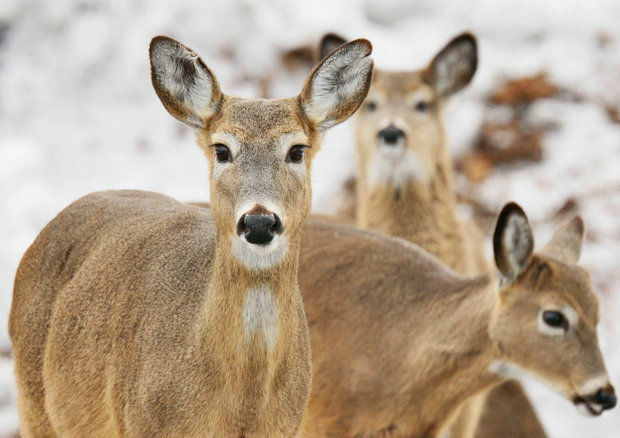 For example, many deer can be found in the forests of New Jersey and on the lawns of many NJ houses. Whenever the deer are seen, they instantly catch our attention and nature looks a lot more pleasing because they look very cute and also because we see the interaction of different species with each other. Congress even stated that endangered and threatened species of wildlife and plants "are of esthetic, ecological, educational, historical, recreational, and scientific value to the Nation and its people." Because New Jersey is made up of several different habitat types, such as beaches, marshlands, and forests, there is a wide variety of species native to the area. For this reason, it is all the more important that New Jerseyans and beyond take a pledge to preserve the diversity and wonder of our own backyard.